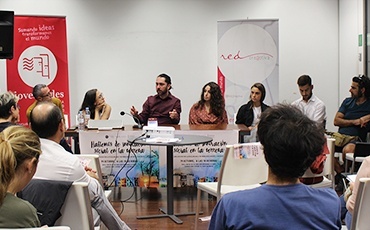 On October 26th, Jovesolides and Red Creactiva organised a seminar called “Let’s talk about social innovation in our region”. 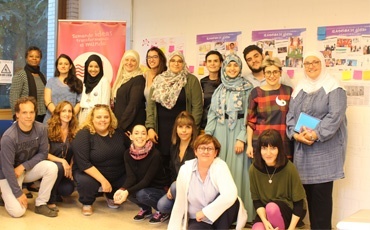 This seminar took place in the Centre de Cultura Contemporània Octubre (València) and its goal was how to tackle scalability as a key element of social innovation and to make social entrepreneurship visible by means of different initiatives carried out in the Valencian Region. The seminar was supposed to take place on October 19th, but had to be postponed. Therefore, the agenda suffered some changes. The keynote speech was done by Luisa Guerra instead of Javier Mazarro. As an industrial engineer and member of the technical staff of the Technology Innovation Center for Human Development of the UPM (itdUPM), she spoke about scalability in the processes of social innovation. 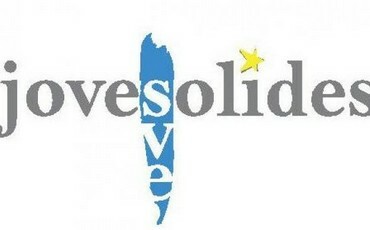 Lourdes Mirón, as President of Jovesolides, advocated for a society in which social innovation gives us support in order to be a fairer and more humane society. “An intelligent society not only does charity work, but also looks for creative formulas to offer a decent living for everyone. While there is still poverty, social inequality and Human Rights are not respected, social innovation will still be necessary”. During her presentation, Luisa Guerra pointed out that there are initiatives with a lot of potential that are designed as pilots (in most cases) that are not prepared to grow afterwards. The main barriers that she pointed out were “insufficient financing, a fragmented ecosystem and a talent gap”. Luisa Guerra emphasised that, in order to make a commitment to promote scalability and not die trying, it is necessary to “scale up things that work, to respond to social needs and to develop demand”. After the keynote speech, there were four micropresentations following the Elevator Pitch format- The speakers had nine minutes to present their initiative or the work of the social enterprise that they represented. First, David Molinos, from the Amics de Palanques association (Castellón), introduced the Fontivent project. “An automated machine that condensates environmental moisture in order to obtain drinking water in places that are exposed to wind”. Secondly, Fernando Ortiz and Alisa Marghelli, from Feedback Cultural, a company specialised in cultural management, presented one of their social innovation projects: Cultura Accesible (Accessible Culture). This in an initiative aimed at “bringing culture closed to blind people and people with sight disabilities, as well as the public at large”. To do so, they create accessible content for museums and galleries. 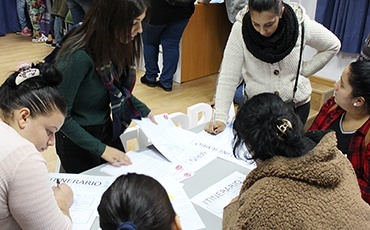 This project was awarded by the Valencia City Council Ayuntamiento de València with one of their subsidies for social innovation and development. The third micropresentation was held by Andrea Lorenzo and Kilian Zaragozá, that together with Josevi Villaroig, form Nadie sin su ración diaria (No one without a daily ration), an initiative the main aim of which is to normalise the donation of food in society. 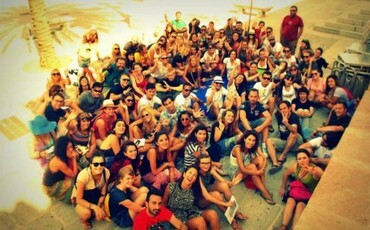 They were the final contestants of the first edition of the UJI Emprèn On Social Program. Finally, the fourth initiative was presented by Manel Alcaide, CEO of Visualfy,a social enterprise that focuses on increasing the quality of life of deaf people by means of technology. Recently, Visualfy has been acknowdleged by B Corporation as one of the organisations with a better social impact in our country. After all the presentations, time was allocated for collective participation. The event was closed with a space which was perfect for the exchange of ideas during which participants could enjoy proximity products from Localea (formerly known as Waycolmena), a social catering company that is also a social entrepreneurship initiative from our region. This event took place in the framework of the InnovaT project and possible thanks to the collaboration of the Regional Ministry of Sustainable Economy, Productive Sectors, Trade and Labour, through the Directorate General for Economy, Entrepreneurship and Cooperative Promotion. 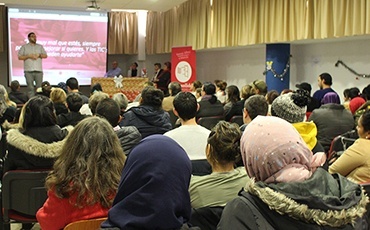 This seminar is part of a long list of activities and initiatives promoted by Jovesolides and Red Creactiva to inform, raise awarenes and to make social entrepreneurship and social innovation visible. To this day, over 30 social innovation labs requested by different public and private bodies have been carried out. Three international fora on social innovation have been organised as well. Besides, Red Creactiva managed to add over 550 organisations and persons to the network. Over 90 pieces of news and testimonials on social innovations have been published. 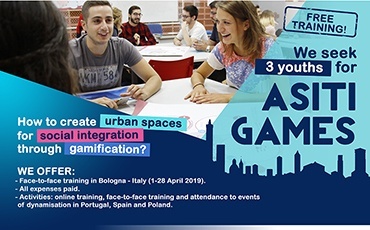 Currently, this task has been extended to 19 countries in Europe and Latin America.